Happy (wet and windy) Friday friends! Starting at 2 am last night we started getting squalls from Hurricane Matthew so by the time everyone wakes up and reads this I have no idea whether I'll have internet, power, etc so please excuse my absence today. Matthew is still a category 4 storm so we're all on pins and needles here waiting to see how it will affect us throughout the day and the aftermath, not to mention whether the predictions are right and it comes back around to hit us for round 2. But I wasn't going to let a little (ok, make that a huge) hurricane stop me from posting today. Especially not to tell you about some of my newest favorite beauty products! 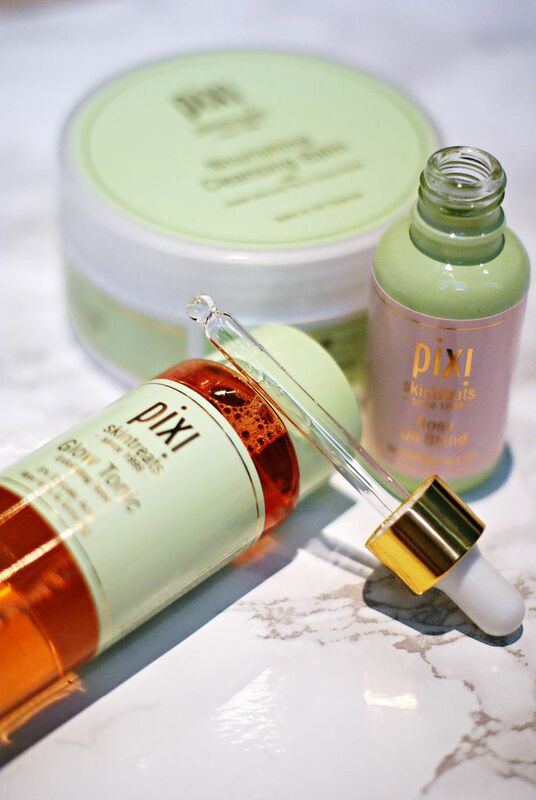 You've already heard bloggers rave about the Holy Grail that is the Pixi Glow Tonic but recently I got to try out a few of their other beauty products and I have to say, I'm definitely impressed! Pixi Glow Tonic $15 - I'll get the Glow Tonic out of the way first since by now almost everyone has already heard about how amazing it is and I definitely have to agree! Despite being an exfoliating cleanser, it's very light and moisturizing on your skin. I've been using it during the morning and at night and I've definitely noticed my complexion becoming less red and more even and glowy. Nourishing Cleansing Balm $22 - So at first I was kinda "eh" about this product but it's definitely grown on me. I don't use it every night but a few times a week has been perfect. It reminds me a lot of washing your face with coconut oil (probably because it's got almond oil and shea butter) and really does a great job of getting all the dirt, oil and makeup out of your skin. I usually have to use an eye makeup remover to get my mascara off but this gets it off easily. I love how soft and silky my skin feels after using it too. Rose Oil Blend $24 - I've expressed multiple times how much I love a good rose oil so I was excited to receive this one. While I still don't love it as much as my everyday go-to, this one is considerably cheaper and still leaves your skin glowing. This oil is a little thicker than the ones I'm used to but it still seems to sink in well! Liplift Max $14 - I was super excited about this as lately I've been trying new lip plumpers but sadly I didn't really notice much of a change with this one. It barely tingled and didn't give any noticeable changes to my lips but it did smell good and the color was pretty. Since I'm not a huge lip gloss fan I'd probably skip this one in the future. Beauty Blush Duo & Kabuki $18 - I got this in the Peach Honey color and while it isn't very pigmented, it is great for a natural look. I love this for the weekends when I don't want a fully made up look, just a light flush with a bit of glow. I've heard that the Rose Gold color is more pigmented but like I said, if you're just looking to give yourself a bit of a healthy glow, this works perfect! Hope everyone has a fabulous weekend. Again, I'll be on social media when/if I can but don't expect too much. Really hoping this storm moves out in time for Saturday since it already ruined my Friday plans! Also, sending all my thoughts and prayers to my friends in my old hometown of Melbourne who are getting this storm WAY worse than I am and my friends in Charleston who had to evacuate ahead of the storm. Praying for your safety! My cousins live in Jupiter, so I have been hearing all the news for them as they prepare! That glow tonic sounds amazing, I need to try this brand! Thinking of you guys and hoping that you don't lose power and if you do it wont be for so too long! Please stay safe! Thinking about you and everyone else in Florida! Glad to hear you're not being too badly affected so for but stay safe this weekend!! That GORGEOUS blush duo looks so glowy! Definitely need it! That blush duo looks so pretty & I still haven't tried the toner! I hope you guys are staying safe and don't have too much damage from the storm. Stay safe during the storm!! 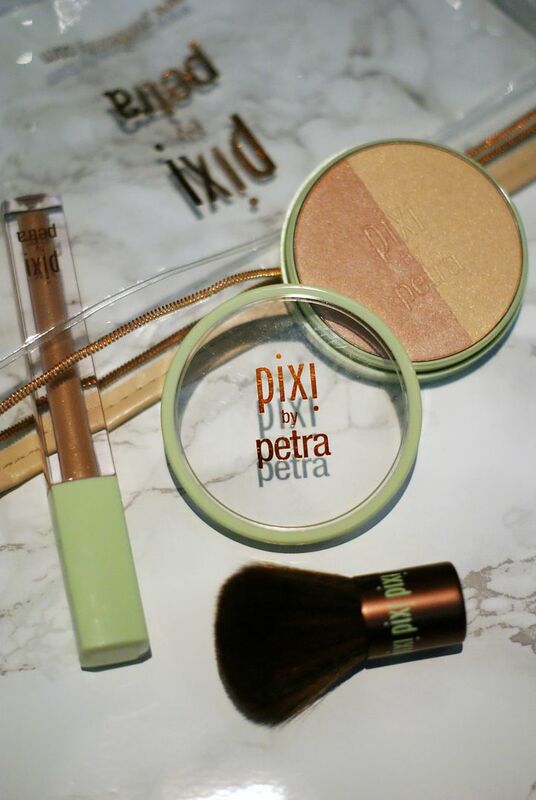 I really want to try some pixi products, i keep seeing reviews all over blogs and YouTube!! Such great products! Especially the price points. The wind is whipping around here this morning! Hope you stay safe girl! So excited to try some of these products, the tonic glow is just amazing! Hope you guys stay safe and dry girl!! I'm newer to the Pixi brand but I'm quickly falling in love with a lot of their products. I now have to try their cleansing balm, sounds like something I'd like! I hope you guys stay safe during this crazy storm. Sending prayers your way! 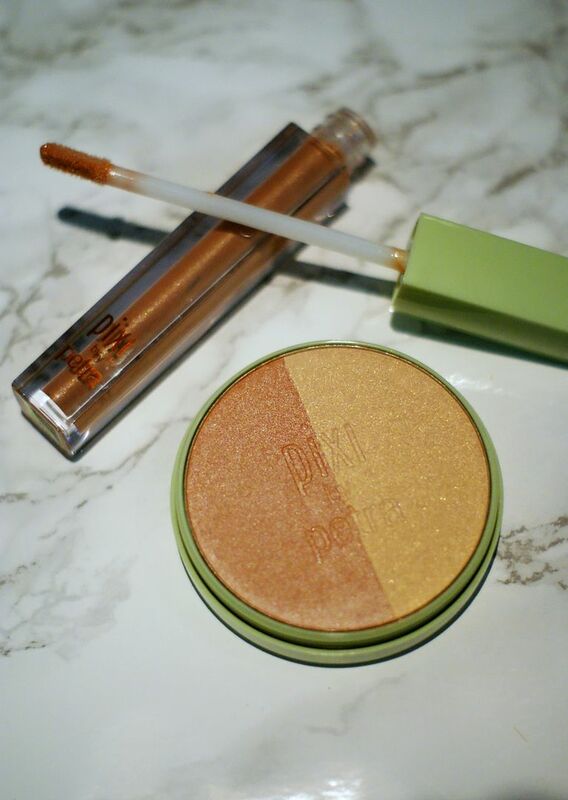 Love me some Pixi products, they are so good and what a great price point, too! Thanking of you all! I may need to try that blush duo! Thinking of you all and hope you stay safe! My sister had to evacuate from Hilton Head - it's been such a scary situation! I have to get my hands on the glow tonic and I should pick up that rose oil! Love your reviews! Hope everything is ok!! The Pixi Rose Oil is the only one I've tried and I love how my face feels the next day but good to know it's thicker than the one you use because I really had no comparison but since I apply it at night behind closed doors, the oiliness didn't really bother me. I hadn't even heard of the Glow Tonic, so I guess I live under a rock! The blush and highlighter duo looks really pretty. I hope the storm didn't hit you too hard. Sending thoughts to all places the hurricane caused damage and hard times! I still need to try the glow tonic - it sounds like a great product! I'm intrigued by the oil, too. 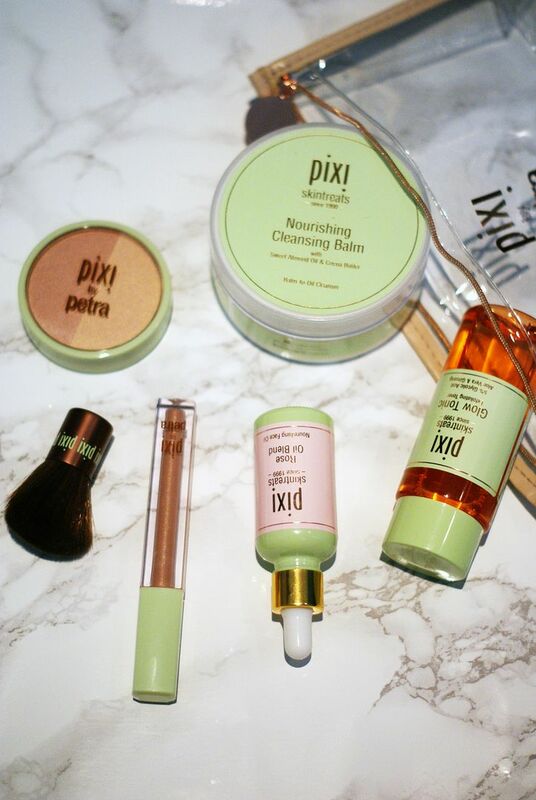 i haven't tried any pixi products, so thanks for this fabulous review of all the products. i'll try the glow tonic first :) i've heard great things about rose oil but still haven't tried it.